The Double Deck elevators derived from our innovative, proactive and problem solving approach, eliminate extended elevator waiting periods and overcrowded lobbies in high rises. 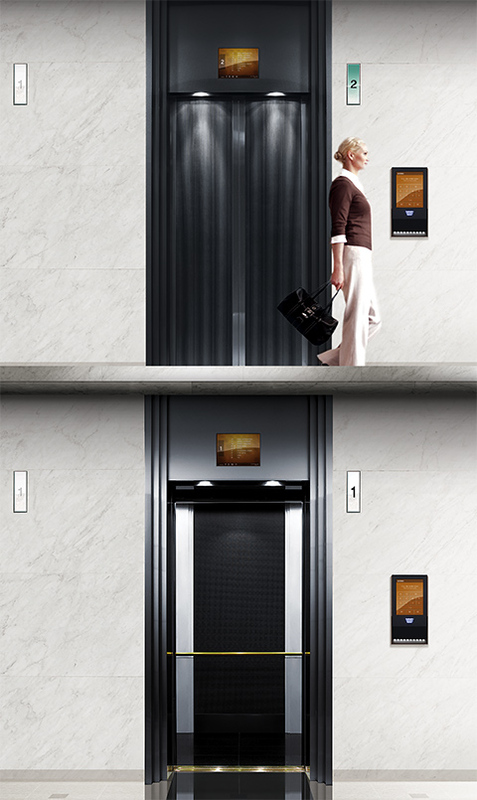 Thanks to the groundbreaking technology of our elevators, passengers can move within spaces comfortably and swiftly. Double Deck technology works with the principle of two vertically connected cabins operating in one hoistway. The capability of the elevators to serve two different floors at the same time minimize waiting and riding periods while increasing the transport capacity of the buildings by up to 1.8 times standard capacity. iF Design Award winner HELIAS Access System guarantees optimal passenger traffic management. Double Deck elevators, produced with cutting-edge technology and advanced engineering work, automatically adjust the distance among the two cabins due to architectural design. Their aerodynamic capsules offer comfortable ride by minimizing cabin vibration and noise. Use of one hoistway for two cabins provide significant reductions in construction costs. A class energy consumption and energy recycling inverter technology of the Double Deck elevators carry energy efficiency to the maximum.